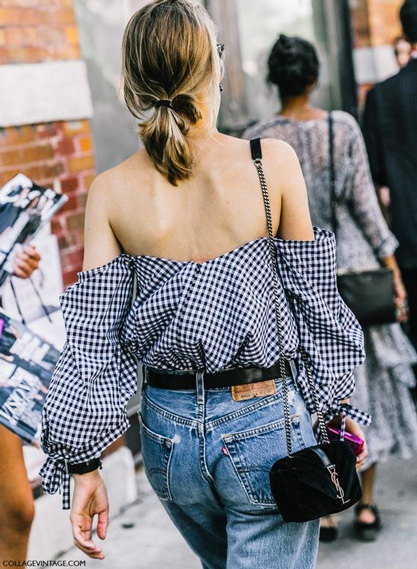 While New York's Spring 2017 catwalks are calling for neons, florals and stripes, the sidewalks are currently serving up loads of gingham. This classic, menswear-inspired print looks thoroughly feminine and modern right now, rendered in ruffle-trimmed skirts, off-the-shoulder blouses, and cropped trousers. Check out these wear-this-minute lovelies from J.W. Anderson (pictured above and second to last pic), Zara, Marquez Almeida, Caroline Constas, Storets (similar to third snap), Preen by Thornton Bregazzi, Front Row Shop, and J.Crew. I love the YSL mini bag! What is the style name? Can you please advise where to buy?